Acting PF President Guy Scott? 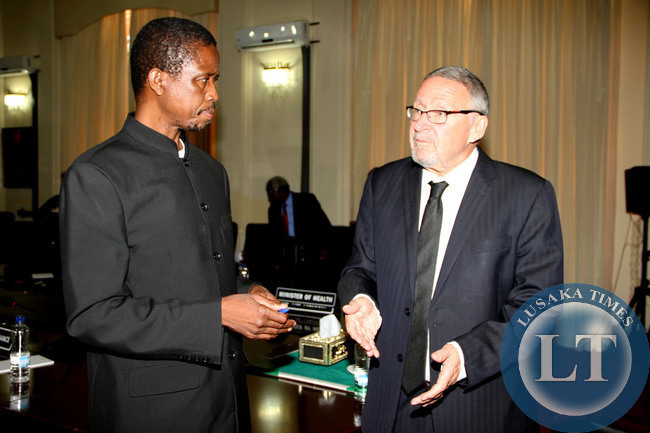 has relieved PF Secretary General Edgar Lungu of his duties. In a letter dated November 03 2014 and released to the media, Dr Scott thanked Mr Lungu for the services rendered to the party. Dr Scott has since appointed Chipili PF Member of Parliament Davies Mwila as the new party Secretary General. But when reached for a comment, Mr Lungu refused to issue a response over the matter. Meanwhile, PF has described as malicious a story by an online media on the health of the PF Secretary General Edgar Lungu. The Zambian Watchdog reported that Mr Lungu was sick and had no presidential ambitions as he wanted to concentrate on his health. Contrary to the assertions made, the PF Secretary General Hon Edgar Lungu is in good health and is providing leadership to the party at this critical time. The PF Secretary General remains grateful for the overwhelming support coming from the general populace of the party across the Country. This is contained in a press statement released by PF director for media and publicity Brian Hapunda. Meanwhile Mr Lungu has urged all PF members to devote their energies and time to mourn the late leader President Michael Sata with dignity and honour. Mr Lungu had not shown any Presidential ambitions this far and it was unfortunate that certain media houses were putting his name forward for the PF Party Presidency without an affirmative response from him as regards the PF top job. “After we have mourned and put our great Leader to rest, he will officially make his position known to the party and nation at large. So should this be to all Party members who are harbouring Presidential ambitions,” the statement reads in part. The story run on online media was a total fabrication of lies and must be discredited with the contempt it deserves. Next articleSocial protection vital for economic growth – Dr Scott. Yesssss!!!!!!!!!!! !Good job Mr. Scott. This is the stage of the game we were waiting for. I just wonder why why why Guy Scott had to resume work when we have just 7 more days of the funeral holiday. Okay, l read somewhere that no more meetings are permitted until the burial of Sata..how then was the discussion to drop Lungu reached?! Did Scott just decide by himself; Two days after the remains of the Cobra arrived?? If indeed Alungu is dropped, then there is no dignity even in death for PF mostly when they r supposed to show leadership during this tense moment for Zed! I predict the fall of PF..opposition, the presidency is urs to lose! I`m speechless !! Why Scott, why ?! I rushed back to read more: without finishing washing my hands, I got soap in my left eye, tried to wipe-off, now got both eyes burning red!! I got HEADACHE. Same as Guy Scott tried to save Ba Sata’s funeral, now he got his right burning by trying to stop the itch of Lungu. He should have washed and dried his tears first before all these emotional actions. Libongani will be remembered to keep this fire contained !! I thought we were supposed to be mourning and no politics. What changed? And you say you should trust a white man and Guy Scott for that matter……Zambians, you will cry!!! Scott will unleash the Police on you using the Public Order Act. my condolences again,,,, just imagine! before you even bury your hero sata,,, there is already property grabbing in PF,,iliko bad! !, PF is going with Sata to the grave,,,,if you doubted! think again,,, another political party is taking!!!! when we told you that you were too immature to understand politics ….. you ran to your usual BS of democracy. All this is Mmembe’s scheme to ensure that Scott becomes President of Zambia after 90 days. I have never seen docile people like Zambian people. The cartel has already won. Next to go is Chikwanda. Which side is bashi Nono? Mmembe is the most powerful person in Zambia. No more noise from Zambians about DBZ 14 billion kwacha and ZRA 18 million rebased owed by Mmembe. Mmembe and Mutembo have won, and Zambians are quiet. Scot and Cartel ve also influenced the ZRA board members to come up with a female COMMISSIONER GENERAL since Msiska s contract ends this month so that it suits them and Mmembe`s NKONGOLE cancalled, you see commissioners fired . @Nostradamus….ha ha ha now that`s hilarious bro. I guess that’s one lesson learnt the hard [email protected] i am afraid you might be right. This ain`t too [email protected] (Kapiri Mposhi) it is too early to make conclusions bro. Stop counting the chickens before they are hatched. Wise men wait until they see some cracks in the eggs at least. Bola panshi. I wanted to mourn Mr Sata in dignity and avoid commenting until after his burial. But Guy Scott ‘s actions have totally revoked the need to observe this period of mourning. What Guy Scott has just done is utter stupidity. Does he think. the Bemba Clique will let him get away with it. I pity Guy Scott, he thinks the cabinet can not seat and decide to drop him. Soon after or in fact as soon as tomorrow, the cabinet can meet and decide to remove Guy Scott and accuse him of sowing seeds of division in the party. He is just an appointee by the late, so he still easily replaceable if the PF decides that it should happen. In as much as I sympathise with what is happening in PF, I am very glad that PF is tearing itself apart even before Sata the chief confusionist is buried. You are either with us or against us ? This was long overdue. The man is probably drunk as I am typing this. Now watch out Mulenga Sata, you are next. Scot gave the threat already. Come November 13, you will no longer be PF Lusaka chairman. Mark my words. Daddy is gone. There is no one to support you. You are a toothless baby ngoshe! This time around lets not give power to PF no matter what. If PF wins these by elections again, then Zambians have chosen to live their lives in abject poverty and they will be the ones to blame such an out come. I urge all well meaning Zambians to think very carefully and vote for UPND the party which is more organised and led by humble , hardworking , and honest men and women. Now is the time to devote all our energies in selling UPND and HH, the only Hope and Help for Zambia. Now is the time to ditch PF the party that thrives in deceit, confusion and violence. Now is the time to defeat PF a demonic party,that believes in violence as a way to win elections. Now is the time to bury this PF confusion with its confusionist owner. Didn’t I say Guy Scott is being used by Mmembe ,Mathani et al… We haven’t even buried Sata and Scott is already changing the people Sata appointed. They were telling us to just mourn meanwhile they were scheming….your enemy is not mourning wake up Zambia and take a hold of your future. Scott is just carrying out instructions from a clique of tribalists. They obviously didn’t want Kabimba so they brought a Nigerian witch finder who, knowing that Zambia is a Christian Nation, came in the name of a prophet to reveal that Kabimba bewitched Sata. Kabimba was fired, the next was Lungu and surely he is gone, next will be Guy himself to give way to the super race to continue ruling Zambia. See the names being floated? Remember that Zambia is a Christian nation but with a lot of people with evil tongue. Remember that the power of life and death is in the tongue. Do you think God is not seeing these. THE POWER OF LIFE AND DEATH IS IN THE TONGUE – God is seeing the propaganda, the secret meetings,………. At one time PF had two members. Michael Sata and Guy Scott. It now has myriads of pretenders to the throne. With here! Lungu, did not do himself a favour by uttering that nonses about giving away power to peace. It also makes him unfit to be Justice Minister. He does not respect the constitution, lacks integraty and maturity. The other thing I mentioned he cant be all things and remain objective. Check: Minister of Defence, Minister of Justice, Party SG and acting president. Too much power for a drunkard. Guy Scott is becoming something else and rendering our independence irrelevant. It is our fault. How do you expect anything good from a white man? During Cha Cha Cha the same white man unleashed the worst brutality on the native black man. Just 50 years after freeing yourself from this white man, you again put the same white man in charge. Do you think he will spare you? Wait a bit you will soon be buying you provisions from small windows. Africa (Zambia) Twasebana. Oh boy! You must love Mother Zambia and the drama. Honestly, I am loving the fall down of the PF. It gives me s sense of relief that maybe Zambians will finally see through all this and now elect real classy leaders. PF had given us more misery in the last 3 years than we have had in 33 years. Dictatorship has now started….I feel sorry for PF. Zambians must rise against colonialist like Guy Scott. We don’t want to go back to colonialism. This man should be removed from power even by the military. Go to HELL Guy Scott. A white man has never been a friend of a black man. History has proved this. Their earlier this white trash is removed from the Zambian presidency, the better. Mugabe must be laughing at us. The PF have made Mugabe look like a saint. I have NO apology to say that Zambians are docile people. One day, a Nigeria will rule Zambia. Mark my words. On the other hand, I am glad because this maybe the chance for HH and UPND to win the January 2015 presidential bye elections. Easy meat for HH. Even Nevers Mumba/MMD has a chance now. If Guy Scott believes in what Sata stood for, why all of a sudden is Scott undoing what Sata stood for? If by any chance Sata resurrects and finds this mess in PF, what can Scott tell Sata? It’s all don’t kubeba. You can’t believe anybody in PF. Zambians please this is your chance to take out PF and bring in HH and UPND. Atleast this party has reasonable people unlike these thugs that have been ruling us for the past three years. I see a lot of demonstration tomorrow from PF members against Scott for this decision. On the other hand, I am just thinking that this may just be working out to be good for the opposition. I said it….now the PF cadres are burning tyres at Belvedere Lodge crossroads singing warlike songs against changes in PF!!! And Police are moving in…..dictatorship is here!! Word on the street is Sata had chosen a successor in early 2013.This successor could not be corrupted. The president’s plans for his successor was leaked to enemies and a cartel. Tragedy fell upon his successor ie he was murdered. Some say the enemies and cartel used greedy evil nephews to kill successor. President Sata was organized and would not deliberately leave chaos. Let Zambia focus on giving President Sata to meet his God. Fred M’Membe you are going too far. This is not good timing. You cannot do such a thing in the middle of mourning. Desperate men do desperate things…he doesnt care about Zed! These people have lost direction. They are breaching even their own Party Constitution, which says that in a situation like now, when the President has been ‘removed’ from office the SG takes over until another one is elected. Anyone who can’t think these days says Fred Mmembe. I am so fu.c.king tired hearing about Fred every second. I can’t even think straight. The game is on and Kabimba is warming up! Pyeeee!!!! This just goes to show that even PF are not grieving. It just proves that these wolves are happy their leader is dead. These are not the people who should be entrusted with the Presidency and come 2016 the whole lot of these muppets should be voted out because Zambia deserves better. Its ba PF self destructing on the launch pad like that NASA rocket.Their 3yr arrogance is coming home to roost. My fellow Zambians can you please educate me. I thought the acting president shouldn’t revoke any appointments previously done by the late president as per our constitution? Couldn’t this have waited until the elections in 3 months? This is a party matter defines by PF constitution if they have any. Even if it was a GRZ appointment, the acting president can still fire provided he has the backing of the cabinet as contained in constitution chapter 38. Not with party appointees. But he (Scott) can’t fire ministers (until his PF party loses the election at the end of January 2015). OK. Well done Mr. President! Edgar had too many portfolios. I’m behind you and I wish you success during this transition period. Let all racists like Gen. Miyanda and others hang. Who is more Zambian between you and RB or KK or FTJ? You obviously but since you were part of this defective constitution, you should not stand since this was your desire. Instead let Wynter or Felix Mutati or Antony Kasolo or such other sober minded Zambians stand. Thanks again for this excellent decision, and we all due respect, I don’t think the president was in good state of mind in the last three months to even know who to appoint as acting president unless someone did it for him. Let’s mourn Sata with dignity and give ourselves a leader worthy of our nation in 21st century. Thanks. Mwamba, shi leka ifyamba, the names you mention, too much smoke in your head!! …the crack is propagating at an alarming rate…….it was a ‘hair’ thin line now I’m able to push in my hand thru…. ….this change couldn’t wait until 12th Nov….? ?…..I don’t expect any party re-organisation or party functions between now and 11th Nov…. Let me not expose my ignorance by either congratulating or condemning Guy for this ka demotion. I do not understand the significance of kicking Lungu from that post. #Nyau, you can not understand the significance of the decision to remove Lungu until you know that the list of delegates to come and select the PF Presidential candidate is compiled by the Secretary General. the Puputteers, are already pulling the strings on Guy Scot. Mwacepa sana ba-kalume! This is M`membe for you. Most of you PF chaps are too retarded to fight M`membe, the guy is miles away in this PF succession game. These are interesting times to be alive in Zambia as scenes unfold. Pass me the bucket please I want to puke! I told you all. This is the guy (Guy) you agree to. I am not shocked because edger and scott are not in good terms. I don’t see any potential candidate in pf apart from edger lungu who served at least on four position(justice,defence,presido,secretary) when sata was out without mistakes. NO DEMOCRACY IN PF. WATCH THE SPACE. THE BEGINNING A BIG FIGHT HAS STARTED IN PF WATCH THE TWO CAMPS / THREE CAMPS TEAR EACH OTHER APART. THE DEVELOPMENT IN PF ARE REALLY SAD. INSTEAD OF WORKING TOGETHER TO MOURN THE DEPARTED PRESIDENT . PF MEMBERS HAS STARTED TEARING EACH OTHER APART. WE FORESAW THIS TO BE BECOMING BECAUSE DURING THE DAYS OF THE GREAT LEADER OF THE PF PARTY TWO CAMPS WERE IN EXISTENCE. WHAT KEPT THE TWO CAMPS TOGETHER IS THE TAX PAYERS MONEY WHICH THEY HAVE BEEN ENJOYING AS FREE MOTOR VEHICLES AND FUEL, TALK TIME, ETC. AS ZAMBIANS LET US PRAY THAT THE CONFUSION IN PF SHOULD NOT SPILL OVER INTO THE NATION. POLICE BE ACTIVE TO MANAGE PF VIOLENCE WHICH WILL SOON COMMENCE AFTER THE BURIAL AS CAN BE FORESEEN. Game of Thrones. The drama has just started…..more popcorns please!!!! Some of us have already forseen what Scott and the curtail are up to but when we speak we are accused of racism.I repeat scott is not up to any good.Sata knew him and thats why he never allowed him to act.You cant be comparing America and Zambia to say if they allowed a black man to rule them why cant we allow a white man.The dynamics are different.PLS THIS IS MY OPINION AND I HAVE A RIGHT TO IT: The only white man i trust is a dead one. Zambians wake up.Remove the veil membe keeps casting on you.This is not what Sata would have wanted.Lets not allow this evil curtail to continue calling the shots. If Sata never wanted Guy Scot, why appoint him Veep? I mean, it doesn’t make sense to appoint someone that you really don’t want or like. Guy and Michael came along way. He was the only one calling Sata as Michael. They were together from day one. Racism apart, Scot is most qualified t carry the PF dream forward (working on an assumption that PF had or have a dream). He is part of the “A” team which the president never disputed when alive. He was the only one calling Sata by the first name? Well, what do you expect? This is the stupidity you get when you have a white friend. You want to behave like them and not them like you. Zambians are always giving up ground for anything that is not Zambia, if it sounds different, has straight hair, has a different skin tone. What has happened in Zambia is not the preservation of peace or rule of law, it pure stupidity. You got independence purely on racial terms and you give it up purely on racial terms. What kind of people are you. You might as well send word to the crown to bring back the British Overseas Ministerial Administration (BOMA). SH1T! Umusungu wandalawa uyu ashupa mwe. Animal farm: Transition from Mana Farm and Animal Farm. Typical politics pa Zed…he couldnt even wait until SATA was in the ground. Interesting times ahead for those of us who are political animals…The coming election will probably be the most important surpassing the 1991 elections by miles. Imwe naimwe chill – this is not a household or a village. What do you mean wait till he is in the ground!? Life MUST go on. Are you even suggesting you have also stopped listening to your favorite comedy show on DsTV? What a bunch of funny people you are! Yaba! This is why you are always dribbled; bayanu bateya nsolo imwe muli ndwiii ati tilila!!! Amama neo! Bad timing. Scott’s wrong with the timing of firing a fellow party member appointed by his late friend. We are beginning to see cracks revealing him as the biggest traitor. He’s betrayed the very person he’s mourning. He should, at least, have waited until after the burial. Never trust a white man. These are the same people who used the Bible to rip Africa’s resources. You are gullible ain’t you…you think any politician would even wait 24 hrs sitting on his/her hands when there is a leadership vacuum? Politics is not for the faint hearted…those waiting till the 12th will find their only support they thought they had, has been bought off just like that with cartons of chibuku…..we told you! Animal farm: Transition from Mana Farm to Animal Farm. This is really laughable …Only in Zambia can someone urge other people to devote their “energies” to mourn …and for whooping 14 days. Meanwhile you are there urging people to mourn yet your colleagues are busy planning working in the background and sacking you. These predictable empty tins are not fo0ling anybody but their gullible cadres…please reduce this mourning period at once for a President who was prone to enjoying AWOL this is too much. So ZWD was on to something…about this reshuffle! This is one of the reasons for firing Lungu.The second is that Lungu claimed to have “handed over power for the sake of peace”, when infact cabinet had sat and, under the advice of the attorney general, had enacted article 38 of the constitution (since article 39 had lapsed with demise of Michael Sata) to strip him of power and ,rightfully, hand it to Guy Scott. The next one that needs to be fired for indiscipline is Mulenga Sata.Very good Scott! Lets have some semblance of order and discipline while we mourn the deceased president. I thank you. Allowing the whiteman to sit in a blackman’s chair is an abomination. Get the muzungu out of our house! And the dribbling continues…..in broad daylight. I think this idea that we are peaceful is just a mask for our cowardice. And I’m including myself too. So we pretend that it’s what God wants, so we don’t have to do anything ourselves. But at least I am not afraid to talk via blogs. And I’ll say it again – Scott cannot relate to you, a black Zambian from shang’ombo. You should be ruled by someone whose village can be pin-pointed on the map. Protect yourself and what you have. Stop the nonsense about racism, the constitution (which is in draft form) and God choosing Guy Scott. This is as the watchdog revealed! They said the cartel of GS,FM n WK planned to drop EL as party SG and it has come to pass. Prophet Watchdog. Zambia being led by 3 people. Too bad, changing positions during the mourning period, why didn’t GS wait for this to pass? Zambians wake up. Don’t let 3 people tear us down. The school of Sata taught these guys how to press the wrong buttons with guarantee of no repercussions. What have we done to mother Zambia? This country will explode even before the old man is put to rest. They are moving very quickly to consolidate power but real power is with the people. Now is the time to put an end to our misery, we need a new constitution pronto! Guy scot should go 2 scotland now..no peace in da country.imusungu anaulu party.chinangwa.he doesn’t care abount zambians.Mwaonaula icalo.wrong timing icipuba ici. MA MA MA MA, one of the God fathers in PF has started moving his chess pieces quicker than I thought, Who’s side has the other God father (chikwanda) chosen? Things are getting interesting and just as predicated. Bati nga kukonka imimonekele shena, Mr Lungu looks weak and delicate but so does Guy Sctott. He is still minister of defense, mind you! As far as I am concerned the Name SATA is tantamount to SATA-N…. and SCOTT is the head of (Satan’s Cohort Of Thieves & Tricksters). What happens in an event that Lungu resigns as Defense Minister and Justice Minister? How about if say 20 other ministers resign? Will those ministries operate for the 90-day period without a head? what happens if he exercises his portfolio as defense minister, let’s say tomorrow? What do you mean exactly? He is still defense minister and still exercises his duties daily right? @jesse Wam town wants to see huge fireworks go up in Lusaka! Some of us still have friends and family in the godforsaken country! We don’t want kiju, kiju, kiju, boom, kiju boom, kiju kiju…….boom boom bang! I also have family and friends. The Acting President has decided to relieve Honorable Lungu of his duties as Party Secretary General following the sentiments from Lungu which indicated that he gave out power for the sake of peace. Here Lungu avoided to state that he gave out power due to the constitutional demands, it seems he also wanted to be acting president despite the constitution not supporting him. Dr. Guy Scott is righty to relieve the man of his duties, though he has not solved any problem because knowing how Edgar Lungu is, he may equally resign his 2 ministerial position a move that will spark unbearable division in the Patriotic Front. I urge Guy Scott to use his influence after the burial to have Mulenga Sata relieved of all his duties including those of mayor for his indiscipline. Congrats Dr. Guy Scott. Repeal the constitution clause that barred non pure Zambians from Standing. It was ascheme by chiluba to bar Kaunda from recontesting. Guy scot is surely the best candidate not for PF alone but Zambia. WAPYA MUNZI. Hatwende kumalende tu kapaile. Guy scott mwandi u’re brought crisis in 7ambia.now we are crying more 4 Sata. Just because you had a black President it didn’t mean you were free, who supplements your budget? Who controls your churches, who’s that white man’s portrait hanging in your churches? Who do you owe that debt that foreign debt? We will only be free when you change your mindsets…go and research more about self and you will truly be free my friend. with provisions of Article 48 of this Constitution. President or Secretary General of the Party shall resume his duties. Leadership can be viewed from integrated dimensions of traits, behavior and the leadership situation faced. Given situational unfavourableness as when in crisis such as this death of our president, considerative behavior would be expected from a good leader. It’s a hallmark of poor leadership to demonstrate autocratic and directive behavior bent on exercising punitive powers on those perceived to be contending for ones position. This crisis needs a uniting factor not a divisive force. respect the party constitution what more the republican one.Get ready, he will freely R ape it from all angles. I jist dont get it why we zambians cant learn from history. Let us defend the constitution. Guy Scott has no legal right to revock the appointment of Hon. E. Lungu. This is provided for under Article 38(3) and Article 39(2)(b) down there. This is proof that MMD was a more mature party than these power hungry hooligans. I think Scot has miscalculated. He has show the cartel hand, too quickly. I don’t see PF going forward as 1 bunch. Lungu has earned himself a little mo respect among the pipo than Kabimba & Scot put together. Lungu soldier on. You shld take your case to the pipo. I doubt Scot can put up a person with a beta standing than you. You have options. So many immature and premature reactions to the development. PF are working to prepare for the candidature of Edgar. As Secretary General he could not put himself forward properly. There is no war or Armageddon, as some think. Let us not blow things out of their proper proportion; and whichever online news provider is bent on destabilizing our nation must be ashamed of itself, if it has any conscience. Those who are in the employ of the same online media must remember that while their boss domiciles abroad, they are in Zambia, and he will not give them asylum should our country go up in flames because of the evil intent of whoever these chaps are. God bless and comfort Zambia. You are very correct. If you were to follow all of GS ploicies you will find they favour investors from Europe and America, GS has always been in the forefront to prop up firms that abuse black Zambians because I honestly think he doesn’t realise he is a racist which he is by the way he conducts hiself with black Zambians and the way he talks to us. Enough of racism, the biggest error the late HEMCS (God bless his soul) made was working with Guy Scott, the man is a chameleon. @2020vision I agree with you. People need to just listen at how Guy speaks to Zambians especially in Parliament on Fridays it is cringing. It is a pity that Zambians are to docile for their own good. I would rather have Mugabe rule us than Guy (I am not racist and wouldn’t mind Zambia importing David Cameron but of course not Tony BliAR!). Guy Scott is arrogant and ni opusa zoona! If you think of the way Wynter Kabimba was dropped! Guy Scott is only returning the favor. PF should be in the entertainment industry, not politics. Plan on creating a PF movie soon! This guy can destroy Zambia.he should resign now before its too late.He belongs to the cartel.owe no peace.why why why icimusungu ici. This kind of drama in PF is not new. The whole turn of events in Zambia has proved one thing–That Zambians can be taken advantage of. We are full of mazi. Scott has been Veep since Sept 2011 and we have not done anything about it. Now reality is sinking in and we are still doing nothing. If you are upset with him the do something drastic to be heard. I don’t mind that PF members are being fired — the trouble is that they are not replaced by better, more capable citizens. Honestly, it is as if PF is making every effort possible to shoot themselves in the foot. When the watchdog says there are factions and there is cartel run by Meembe, we have all attacked them. Clearly the self destruction has began. The funeral is not even over and we already seeing confusion. This will not go down well with some sections of the party. Why is scott in a rush to start firing people? Is he being held to ransom by some people? We saw this coming.The cartel are also zambians and let them help out. This confusion was caused by the chief of confusion himself,the late. What was the logic in piling all those positions on one person? Why was Lungu so indispensable? Something was seriously wrong. Guy Scott is correcting what was wrong. Some of you r just yapping…!! Sata, Kabimba and Guy Scott formed PF he has ALL THE RIGHTS TO FIRE LUNGU !! PF is his party !!! Illogical thinking! So Kaunda can go to UNIP and fire anyone he feels he does not want just because he formed UNIP? Foolishness! Indeed, truly,I love your comments, the baby ngoshe is living in past glory, I feel pity for him…………!!!!!!!!!!!!!!!!!! Strategy bane. Read between the lines. Such action demonstrates why Sata never allowed GS to act as President. It is so sad that GS has overturned HE MCS choices. Where is decency in this Mr GS? I’m on record of saying many times that Scott can not be trusted, it is unfortunate for all that he should do this. Party of clowns digging the grave using a Zambian manufactured PF bomb. Cha-Cha-Cha!! Zambia prepare to fight. January 2015…Chikamoneka. Scott is asking for trouble. Sata could get away with comedy. I don’t think Zambians will tolerate the same gags from the last commoner of Scotland. Small children! So, they are not at the funeral house or is this happening while there at the funeral? Amazing Muzungu! PF’s lunacy is now turning into an Ebola virus. You did not heed our criticism. Now you are paying the price. Learn to treat others the way you want them to treat you, simple. In PF it has been a Shaka Zulu type of affair. People wake up. This move is actually good for Edgar Lungu. He can not be the party secretary general and at the same time contest for presidency. Watch this space. Ati You with us or against us, Mushota just hit the nail on the coffin, Scott is operating on a different level, to take out lungu and kambwilli is quiet!! To be honest I new this would happen (commander in chief), but not this fast. So the cabinet has sided with Scott and where is Chikwanda (watch this space)? The shame of Sata has began even before he is buried, albeit is hearing in his casket. Guy Scott has traversed the Bemba tradition of the dead. Undoing what the just deceased was endearing in life. What a shame to the Bemba culture by mwisa. Ba Sata these are the problems you have put us into. When shall we reach rock bottom to these PF problems. Could this Scottish man not have waited until the funeral is over? This is the time to unite us and not divide the nation. am not sure if this move is in the interest of the nation? We all know that when there is blood shed Satanists flourish because they feed on blood. Fellow countrymen this is a spiritual welfare let us earnestly pray for our country, we should not give these Satanists a field day. You have heard that in the last few weeks or months the devils nest was ruffled. We do not know where we are going??? BREAKING NEWS!!!! Chipili PF MP Davies Mwila has turned down his appointment as PF Secretary General by Acting President Guy Scott saying he is mourning President Sata… WAPYA MUZI – Ndeloleshafye!!!!! I have been thinking could Guy Scott have plannned this with Edgar Lungu. If there is a new SG then it gives Lungu more time for himself and plan for the upcoming elections as a Presidential candidate. This might actually mean Lungu is standing. So they are positioning themselves to catch the opposition unaware. Up until now, it has been child’s play in PF. The party was seen as belonging to Sata. He was the voice and the only voice. But if PF is to now earn the respect of the public, it must be seen as self-existing. Guy Scott is the boss now. Forget about who was the boss yesterday. PF needs to transform itself into this new reality. Otherwise, it will remain in its past. The transformation comes with obvious pain. UNIP failed the transformation process. It remained Kaunda’s party. In a way, it still is to this day. In consequence, UNIP failed to regain lost glory. Today, it is for all purposes, a dead party. UPND struggled through the transformation process. To this day, it is still work-in-process. All this at no small price. MMD’s cardinal error was to reach back to UNIP’s obsolete policies and political strategies. One wonders why a party so progressive could not chart a course of its own. Today, MMD is on the death row! The ball now is in PF’s court. There is so much talk about Sata this and Sata that. It’s high time this party moved on. It can rebrand itself and come out a winning party. As long as it remains a Sata party, it is heading nowhere, unfortunately. The reason why Mulenga Sata is grooming himself for the presidency is none other than that he is Sata’s son. He sees himself, purely by virtue of the fact that he is Sata’s eldest son, to be heir apparent. This is horrible and disgusting. Should PF take this route, it would have to be perceived as a Sata party and nothing else. Most of us bloggers on LT are not helping the situation either. We see it much more like a bull fight or a dog fight or such other similar sporting event. Our cheers and boos are taking their toll on these poor politicians. The less educated a politician is, the greater the tendency toward being irrational in behavior. Davies Mwila has rejected the appointment according to ZNBC news. I said before that Scot needs to be caged. Anyway, he is meeting the boys tomorrow at 07hrs and he will even wish he never accepted the position. Things are not the way they seem. Lungu and Scott are still in good shoes. It is a good move. They are preparing him for a better position. Watch the space. Tyres are burning on Leopards Hill Road close to Belvedere Lodge. Police are turning away motorists from Crossroads Shopping Mall. There is chaos! I hope no blood will be drawn. Me too, I was turned back whilst driving along Leopards Hill road hoping to turn into Middleway Kabs. The cadres are chanting ….twalaizandamuna bonse nibangwele…..
Scott, lelo lelo..lelo lelo………cha cha cha yaisa!!! We told you comrade lungu that if you show weakness in politics, you get eliminated. You had it all instruments of power and the defense ministry in hand for a reason, yet you let some chap dribble you around. Did you hear what guy just said? He said take me to court. That should have been you uttering that. I actually feel sorry for you because I think you are a good man but soon you will be roaming around an ordinary guy saying what if. We urge the acting president to suspend the importation of matchets into the country. We love our children. Did he just do that? Did he just bury PF before he could bury its founder? He is very White! Wait and see what I mean. What wrong has Kagame done to deserve this kind of humiliation? It’s unfolding as exactly told by watchdog way before this happened. Then this is true that Mmembe is in charge. Scott tols every member not to work in honor of his mentor yet at the command of Mmembe he was having meetings behind closed doors. This is the same Scott who called the Lozi last year ‘stupid and tribalistic’, to which he even apologized in parliament. Most of you, if not all of you have no idea what goes on in the inner circle – you comment 100% based on the biased media reports you read. You cannot even for once fathom that this demotion could be a good decision. If you honestly think Lungu should lead a political party you are really dull beyond imagination. And you really think the Acting President should let the country descend into anarchy simply because it is mourning time? The guy must govern, and the country must go on. This confusion is a seed planted by the late President who had good intentions but lacked intelligent execution. Order must now return to governing. In the last days of his Presidency, I think the late president was not mentally able to rule. We need sobriety in the PF, just to be respected as a political party. No the acing President mus not even interfere. Lungu is Defence Minister and Jutice Minister. It is unbelievable that even after the predictions made about the Cartel, you still want to be ruled people who reuse to pay taxes, bills or even loans. Guy Scott is not serving the interests of ordinary party members. He is there just like Sata to protect Mmembe from paying borrowed money. Lungu must not take this nonsense from Scott lying down. Scott is dubious and cunning, why is he firing people even before the burial? Does this man have any culture? Zambians can rule themselves, they don’t need callous outsides. No one could have said it better. Excellent comment! If them kaffirs argue, shoot them! Guy Scott must be carefull with our peace!he is playing with fire.Edgar Lungu is the one many PF voters want to succeed Sata!I wonder if our OP works as they can easily advise Scott never to drop Lungu after getting the public opinions!anyway despite the chaos in PF,God will help us pull through!HH and others have no chance to win! MEANWHILE THE OPPOSITION ARE PLANNING TO FIELD 20 PRESIDENTIAL CANDIDATES. RESULT: EVEN WITH THE SEEMING SELF DESTRUCTIVE BEHAVIOUR (INTERNECINE STRIFE) IN PF THEY WILL EMERGE WINNERS WHEN THEY FINALLY FIELD MULENGA SATA WHO ALL ALONG WAS THE PREFERRED CHOICE OF MICHAEL SATA. MHSRIP!! Hmm 10 shocking stories per day it seems are coming now. What is the source of this story? Quite interesting that the Acting president is no way in mourning but racing to fulfill selfish agendas within the PF. For those of us that never supported this party, actions of relieving someone off duty while mourning the person who appointed him is clear show of disrespect for the departed guy. I just want to bring to the attention of the readership on this forum to see who really was and is hungry to have the reigns of the nation, obviously for selfish reasons, and to plunder and plunder with impunity! Let’s vote these folks out now, an opportunity has come. Let’s talk minds that think to develop the nation. We have a viable alternative, and let seize the moment. This puts Mr Musa Mwenya in a comprised state. Hahaha,Zambia ni inchi ya watu wajinga,mabeberu,wakoloni na madikteta.Zambia ni inchi chafu kisiasa na kwa mazingira . in 2001 MMD was ripped in 3 major parts: PF, FDD, Heritage Party. But MMD still managed to win. Zambian politics you can only wonder. Mr. Lungu is not presidential material. He has no passion or courage to speak and show direction. People like him for his weakness. Scot is truly Satas student and he is doing exactly what Sata was doing. Hire someone at 12:01 and fire him at 12:02 with immediate effect. I am not even sure if Edger was left to act by Sata? I have questions. Sata left abruptly for Medical Check Up with close family????. Did he even have time to appoint appoint anyone to act??????. Why are people surprised about cartels? politics is about cartels UPND is a cartel, MMD is a cartel, NAREP is a cartel??? To sit and celebrate PF challenges will be folly for the oposition because PF is dealing with its issues earlier and if you have eyes you will see that they are making hard decisions now when you are all thinking of crying and morning our beloved president. 2. THE EARTHQUAKE WE EXPERIENCED IS A SIGN FROM GOD THAT EVIL IS ABOUT TO BESIEGE OUR COUNTRY AND BY SUCH ACTION YOU CAN SEE HOW THE EVIL MEN WILL GROUP AND CAUSE LOSS OF INNOCENT LIFE. Muzungu opusa, this Guy is power hungry, he was waiting for King Cobra to die. This man has no heart for the people of Zambia. Kick this bustard out before chaos engulfs Zambia. The power lies in the MCC, article 58 of pf constitution, allows the MCC to take disciplinary action against official including Scot. The MCC can also make any changes to rules and regulation in the intrest of the party, security , nation. 3. The timing is very bad, why should we mourn our leader when the party which brought him into power is not respecting his funeral. Read analyst below. Who between Lungu and Scott has more power over the other in PF? PF is coming from Lima Party whose promoter was Scot. PF was formed and is owned by Scot and Sata. All these other guys like Lungu, given, Kambwili, GBM, Nsanda, are just workers for the shareholders, sata and Scort. its like you form a company with a friend , your friend becomes a CEO & Chairman and you become a director business development, then your friend dies. Can you allow your employee,lungu or kambwili to become a CEO & chairman, definitely no. in short Scot is now the soul owner of PF. Note also that by Scot acting as president for 90 days does not guarantee him president after 90 days. I fail to understand why we like talking things which bear no fruits. if we don’t want him let us vote a person we want. Scott is not used to political battles, he will be bruised!